Lagan Valley MLA Robbie Butler launches the survey with Denise Cranston of Business in the Community. INUS Mental Health. Lagan Valley MLA Robbie Butler has backed a new Mental Health Wellbeing survey. With one in four of us predicted to experience a mental health problem during our lifetime, mental wellbeing at work is increasingly considered a critical business issue. To help understand the current situation, Business in the Community is calling on employees across Northern Ireland to take part in a UK-wide Employee Mental Wellbeing Survey. The survey, which is the largest ever survey of mental health in the workplace, is designed to get a complete snapshot of the mental wellbeing of the UK workforce. It aims to raise public and employer awareness of the importance of mental wellbeing and identify how well equipped managers and employees are at spotting the early warning signs of poor mental health. Robbie Butler, a member of the All Party Group on mental health and UUP mental health spokesperson,said, “Mental health issues currently directly affect 28.5% of our population, with a wider impact on the families, local communities, and of course, employers of those affected. “Given the prevalence of mental health issues in our society, it’s vital that we seek to understand and address the underlying issues. “Figures show that stress accounted for 43% of all working days lost due to illness last year. Denise Cranston, Campaign Manager for Business in the Community added: “We are delighted to be conducting this much needed survey as part of our Mental Health at Work campaign. 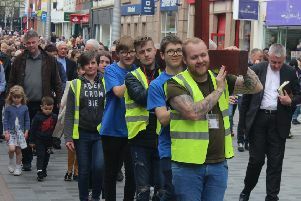 “Locally, there remains a stigma around mental health, and many employees still feel unable to raise any concerns or issues that they may be having with their employers. “Our aim is to improve employee wellbeing by raising awareness and supporting employers. “We hope that the survey will give us a better insight into attitudes towards mental health in Northern Ireland and provide a rich resource to help us build guidance and support for employers and employees.